When we last caught up with Skywind, it was for its second official development diary . 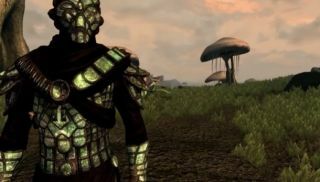 But as interesting as the internal workings of this Skyrim mod team are, I'm more interested in the results—a full recreation of Morrowind in Bethesda's latest engine. You can see how far the team have come in this new trailer, which not only provides long and sweeping shots of its alien locations, but also gives a look at the creatures and clutter that will populate the renewed world. Skywind currently isn't available to the public, but, as announced at the end of the trailer, a "public developer alpha release" will be coming soon. What's a public developer alpha release? Good question, and one that the mod's makers aren't answering—saying only that "it will be revealed in time". For more on Skywind, check out last months Daedric ruin-focused "Remnants" trailer, embedded below.